US President Donald Trump delivers his State of the Union address to a joint session of Congress on Capitol Hill in Washington on February 5, 2019 as Vice President Mike Pence and House Speaker Nancy Pelosi look on. Politics in the United States showed an undeclared move of the campaign for the next presidential election in 2020, with the State of the Union address by President Donald Trump before members of the US Congress at the Democrat controlled House of Representatives on Capitol Hill, earlier this week. President Trump called for renewed unity in his address, widely covered by the media as an important national event, but the stuff of his address showed the stark divisions within US politics, especially the divisions caused by him, in his determination to build a wall on the southern border of the US, as well as strong attacks of the current federal investigations into his alleged activities during the election campaign in 2016, and other questionable acts of his administration. The weakness in his call for national unity came with lack of any regret for the recent shutdown of more than 800,000 US administrative employees over the failure to obtain the US $ 5 billion for building the southern wall between US and Mexico. “I will get it built” he declared to cheering Republican members of the Congress, underlining what is the defining battle in his first two years in office, while Democrats were silent at their seats. This was shortly after he opened the State of the Union address with his appeal for unity between the country’s two major political parties, in a rising conflict of political interests. The electoral politics of Donald Trump was underlined in the contradictions in his address. “We must reject the politics of revenge, resistance, and retribution -- and embrace the boundless potential of cooperation, compromise, and the common good,” Trump told Congress, and added “We must choose between greatness or gridlock, results or resistance, vision or vengeance, incredible progress or pointless destruction,” in his speech cluttered with surging rhetoric and regular interruptions by his Republican camp. His words did sound familiar with similar rhetoric in his first State of the Union address, to what was a Republican controlled House of Representatives. The situation was clearly different this week, with this address having to be postponed because the Democrat controlled House was against it while his ‘shutdown’ of one third of the US administration, caused by largely Democratic refusal to his demand for funds to build ‘The Wall’. Democrat Nancy Pelosi, the Speaker of the House, who was seated behind Trump in her renewed role of Speaker, was a reminder that in the past 24 months the divide in US politics has shown no sign of narrowing. Despite Trump’s call for unity, with the return to a shutdown possible, once temporary legislation to reopen government expires on February 15, he shows no signs of backing down over the wall issue – the possibilities of unity in politics showed very little signs of reality. 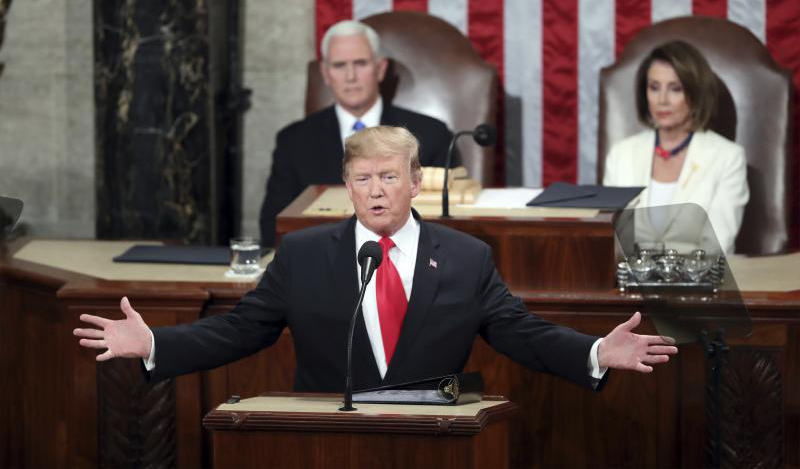 Wall politics was largely the theme of the Trump address, as he said “Walls work and walls save lives,” and outlined plans for what he said would be a “smart, strategic see-through steel barrier”. He renewed his warnings about illegal migrants that were his core slogans in the recent mid-term elections of the Congress, renewed the threat of large, organised caravans marching to the US with savage criminal gangs and illegal migrants. Donald Trump had not changed in the politics and slogans that bring him the support that saw his victory in 2016, and the hope of re-election in 2020. He warned: “The only things that can stop it are foolish wars, politics or ridiculous partisan investigations.” “If there is going to be peace and legislation, there cannot be war and investigation. It just doesn’t work that way,” he said. President Trump has repeatedly decried the investigation into Russian election meddling as a ‘witch-hunt’ and a ‘disgrace’ to the country. The need and offer of humanitarian aid could well be the emerging battleground in Venezuela, with a rejection by President Maduro threatens the dodgy peace in the country. While the Trump administration cuts oil payments and claims all options are on the table to force Nicolas Maduro to stage fair elections, it has also announced an aid corridor through US allies Brazil and Colombia. This aid is strongly supported by the self-declared Venezuelan leader, Juan Guaido, Speaker of the Legislative Assembly, and is likely to lead to major clashes within the country. Venezuela is in a crisis of humanitarian needs. Thousands of citizens have fled, and keep moving to neighbouring countries, for humanitarian sustenance. Yet, President Maduro says the offer of such aid, and its possible entry through foreign military assistance, would lead to an invasion and an attack on Venezuelan Socialism, and national sovereignty. In an unusual turn of events, President Donald Trump has become the leader of this new call to ‘democracy’, with his support for Juan Guaido and moves to remove President Maduro. The Trump call for the exit of Maduro now has won the support of 18 countries of the European Union, including UK, France, Germany and Spain, while it also has the support of the Lima Group of nations, which includes Canada and most South American countries. Juan Guaido has now secured the backing of over 40 countries, while President Maduro has the support of Russia, China, and Turkey, clear signs of an international division with ‘anti-socialist’ forces ahead. The crisis looms with the Venezuelan military blocking access to the Tienditas bridge which links Cucuta, Colombia to Urena, Venezuela, on the directions of President Maduro, who still has support of the Venezuelan military, and continues the crisis, with little relief to the people in need. There is little doubt that the Venezuelan people are faced with a crisis and tragedy of major proportions, with the determination of President Maduro to hold on to power, and the rising impact of the US-led opposition of Juan Guaido, with support of an increasing number of nations in the international community. The situation in Venezuela is made worse by the anti-Maduro forces, in Venezuela and abroad, being critical of the socialist changes brought by the late Hugo Chavez, the popular leftist leader of the country, who was succeeded by Maduro. There is evidence that many Maduro years has led to major corruption and hardship to the people, which has little claims to socialism. The crisis now is the Right Wing opposition to Maduro, his predecessor Chavez, and also the Cuban support for both leaders. The ‘socialist’ slogan of Maduro is clearly under threat, with what is seen as the rise of right with anti-socialist and anti-Cuban politics of the US and its Right Wing allies. 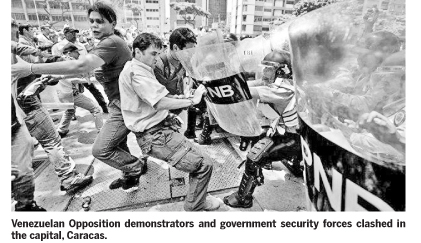 The Venezuelan crisis points to a new rise in Right Wing and capitalist politics in South America, with a louder slogan of ‘Democracy’. The US and its allies in this crisis are silent about the lack of Democracy in Honduras and Guatemala, pro-US in foreign and regional policies. Theresa May is continuing talks with leaders of the European Union in an unrealistic effort to change the Brexit deal already signed between the EU and UK. EU President Jean-Claude Juncker and Theresa May say the talks are ‘robust and constructive’, but Juncker has stressed the withdrawal agreement, already signed, could not be changed as the UK wants. There is an agreement to change the text of the non-binding future relations document, which is irrelevant to the current crisis. Mrs. May insists the UK will not be ‘trapped’ in the ‘backstop’ - the plan to avoid return of Irish border checks whatever UK-EU trade deal is agreed. She says the plan must change if it is to win the support of MPs who urged her to seek ‘alternative arrangements’ when rejecting the deal last month. The UK Prime Minister is trying to overcome the chaos that the Brexit moves have led to, with her inability to present proposals to win majority support in the House of Commons. She will hold talks with European Council President Donald Tusk, who sparked controversy on Wednesday by declaring there was a “special place in hell” for those who campaigned for Brexit without a plan to deliver it safely. Continued thinking in the EU, is the UK had not planned out a proper exit from the EU, in 2016, and the nearly two years of negotiations on the subject led by Theresa May. There is increased thinking in the UK that Brexit has been a political slogan not thought out in detail, on the full impact on the UK, with no consideration given to border relations with neighbour Ireland, an EU member, and the trade dealings with Northern Ireland, part of the UK. There is growing calls for a second referendum on Brexit to work out the proper details of an exit, or if necessary remain in the EU, which is strongly opposed by Theresa May, a supporter of staying in the EU before she became Prime Minister, after the 2016 referendum on Brexit.